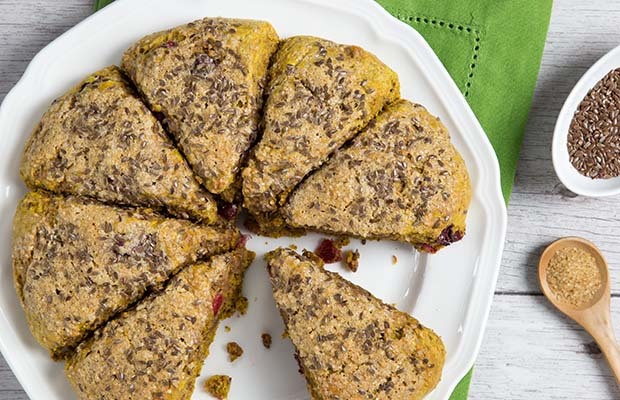 Enjoy these pumpkin and cranberry flax scones for breakfast or your next tea time treat! Combine the flours, flaxseed, sugar, baking powder, spices, salt and baking soda in a large bowl. Add the grated butter and toss in the cranberries. In a medium bowl, whisk together the egg, pumpkin purée, buttermilk and vanilla. Pour into the dry mixture and stir just to combine. On a lightly floured surface, pat the dough into a disc about 1 1⁄2-inches (4 cm) thick. Cut the dough into eight wedges and place on the prepared baking sheet. Freeze the scones for 25 minutes. Preheat the oven to 400 °F (200 °C). Brush the scones with buttermilk and sprinkle with sugar and flax seeds. Bake for 20-25 minutes, until golden and fragrant. Serve warm. Serving Size: 1 piece. Each piece contains 1 Tbsp (15 mL) ground flax.